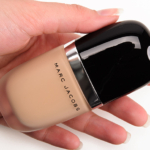 One of my favourite foundations ever for my oily skin! The coverage is light but buildable. It has lasting staying power on my skin through the day even without powdering (which is like a miracle for me). The shade I bought (online) is slightly too dark for my light-medium & warm skin tone in the fall/winter (beige medium 34) but I think it'll be great in summer. I bought bisque medium 26, but I haven't tried it out yet and can't wait!